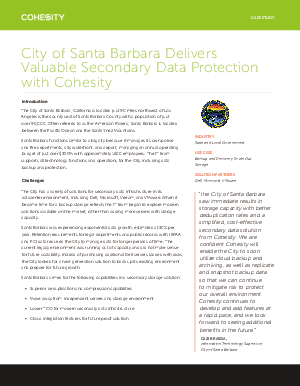 The City of Santa Barbara functions similar to a big city because it manages its own police and fire departments, city waterfront, and airport, managing an annual operating budget of just over $350M with approximately 1600 employees. The IT team supports all technology functions and operations for the City, including data backup and protection. With Cohesity, it gained storage capacity with superior deduplication, and can now focus on moving to a hybrid cloud environment to better manage disaster recovery with the ability to back up critical VMs and data to the cloud. Read this case study to learn more.